TruePoint 3D laser scanned a residence in Texas to prefabricate a wall panel system. Task: TruePoint provided 3D laser scanning services to capture the existing conditions of the exterior façade, at grade, of a residence in Dallas, Texas. The lead time was critical, the client requested a quick turnaround on dimensions for prefabricating a wall panel system. TruePoint’s team of in-house engineers aligned the point cloud files to the client’s model to ensure proper dimensions and fit of the prefabricated panels. Challenge: The client was unable to accurately measure the facade. It was imperative that the panels fit perfectly; the client could not afford the additional time and cost of errors. Also, this was an active construction site, and the client did not want to disturb or slow operations. Solutions: TruePoint’s Texas office immediately mobilized to the site and captured the existing conditions with an industry-leading survey-grade Leica laser scanner. Laser scanning is fast and accurate, the scan technician was able to quickly capture precise dimensions without interfering with construction. Deliverable: TruePoint’s in-house engineers aligned the intensity map point cloud file to the clients Revit model for verification. With the point cloud aligned to the model, the client saw how much his model was off and was able to adjust the dimensions. Added Value: 3D laser scanning captured the length, width and height of all elevations to document the exact dimensions of the panels. All of the corner panels and anywhere the panels terminated were custom lengths that needed to be fabricated to the exact dimensions. TruePoint understands the urgency when clients request data quickly. Constant communication expedited these deliverables. In addition, TruePoint was able to educate the client on using the point cloud directly which reduced deliverable turnaround time and minimized cost, avoiding unnecessary modeling by utilizing the point cloud directly. Utilizing the point cloud directly also provides much greater detail than what can be provided in even a detailed model. TruePoint is experienced in 3D laser scanning for prefabricated panel systems. Call or email us today for more information at 419-843-SCAN (7226) or info@truepointscanning.com. 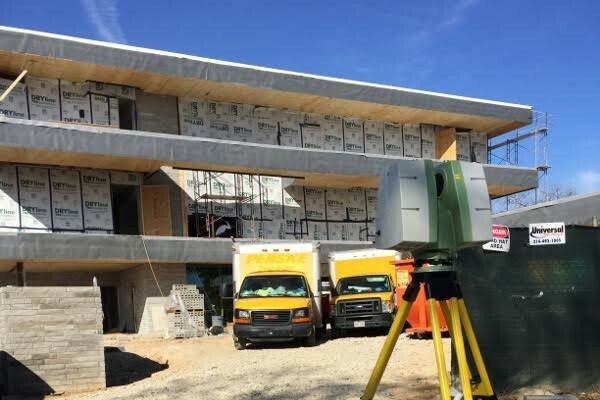 Point cloud data is quickly and accurately captured on an active construction site. Intensity map point cloud of site. TruePoint’s in-house engineers aligned the intensity map point cloud file to the clients’ Revit model for verification.